I got the idea of a personalized book for my daughter from bound books. 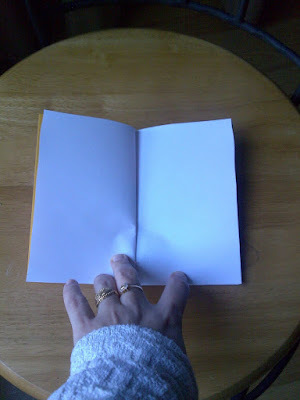 I improvised the idea and made the book, with the help of my three old daughter. She got me all the supplies and I made the book. As I didn't have a hole punch, I used only eight papers to make the notebook, so that the tapestry needle can pass through them easily. I didn't have hard card either. I decided to use the card which Ananya had painted at her school. It was stiff, and more over it had Ananya's name slip pasted on one side. Just perfect. I cut the stiff card in two equal halves and then folded four A4 size paper the size of that card. 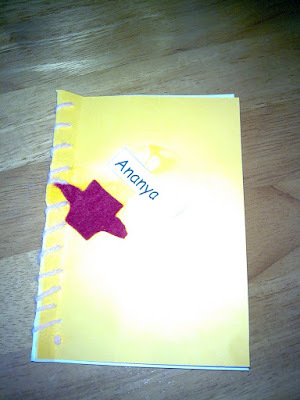 Then I sewed all the pages along with the cards above and below.